Brian Vannozzi, M.D. - Princeton Orthopaedic Associates, P.A. Dr. Brian Vannozzi received his Bachelor of Science in Biomedical Engineering from The Johns Hopkins University in 1999. In 2003 he was awarded his Doctorate of Medicine from the University of Pennsylvania School of Medicine. He completed his surgical internship and orthopaedic residency at the University of Pennsylvania Health System in Philadelphia, PA. 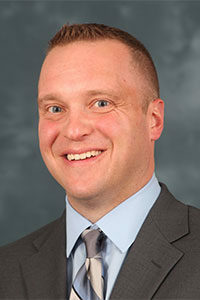 While there Dr. Vannozzi worked at the Hospital of University of Pennsylvania, Children’s Hospital of Philadelphia (CHOP), the VA Hospital of Philadelphia, Pennsylvania Hospital and with University of Pennsylvania athletic teams, providing him an extensive background in all aspects of orthopaedic surgery. After residency, Dr. Vannozzi entered an adult reconstruction fellowship with the Anderson Orthopaedic Clinic in Alexandria, VA. During his fellowship he had the opportunity to work with Drs. Gerry and Charles Engh and received specialized training in total hip and knee replacement, including complex revision surgery, hip resurfacing, partial and gender knee replacements, and minimally invasive techniques of the hip and knee. Dr. Vannozzi was raised in Hamilton, NJ and attended Notre Dame High School in Lawrenceville, NJ. He joined the staff at Princeton Orhopaedic Associates in August 2009. He is an attending physician at the University Medical Center of Princeton and his current sub-specialty interests include knee arthroscopy, hip fracture surgery, and all aspects of hip and knee replacement.